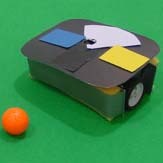 I worked on improving the overhead-camera vision server for the Eleague Robocup robotic soccer competition. My work is described in this report and the code is available here. This work was done during a Summer 2004 internship with Prof. Elizabeth Sklar’s lab at Columbia University Computer Science.